It is by far the most popular model in BMW’s line-up (one of every three BMWs sold is a BMW 3 Series), making it the bread-and-butter in this German carmaker’s pantry. In the spirit of full disclosure, I own a 2011 BMW 335d, the diesel version of the 3-Series. And it’s not my first BMW, I’ve owned several, back-to-back. So I am obviously a fan, and an experienced owner of the brand. This is good and bad, since I know exactly how the car has behaved and performed for more than a decade. I was privileged to drive the 328i and the more powerful 335i sedans on the Laguna Seca Raceway near Monterey, Ca. There’s no better place than a racetrack to test drive a new car – it is where a vehicle’s Gladiator attributes shine, and where its Achilles heel is revealed. 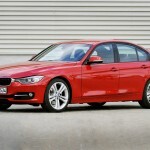 In the case of the 2013 BMW 3 Series, there is plenty to like and admire about performance and fuel efficiency, and just a few things to mourn, as BMW, in its effort to increase profits in a bad economy and in its race to make more fuel efficient cars, has replaced nicer interior materials with lightweight, rough and hard plastics. Here’s where BMW takes the lead. 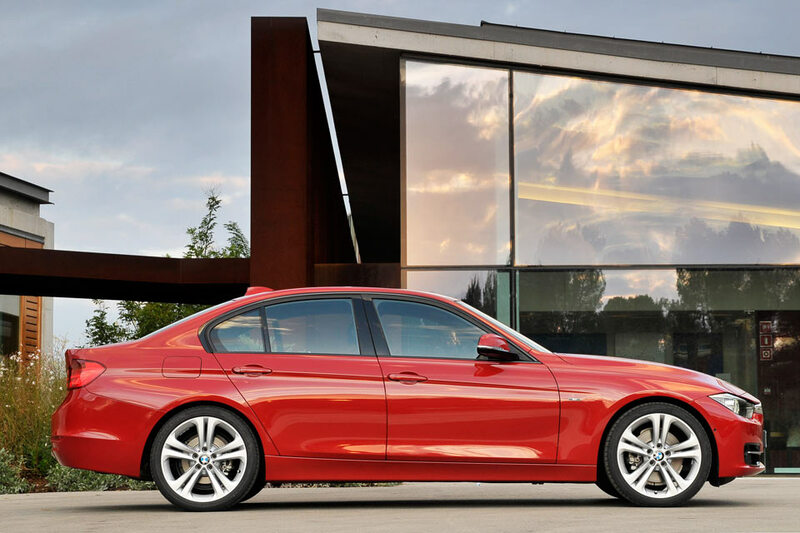 The 2013 BMW 3 Series is the compact sports sedan leader, with sure-footed driving characteristics that make me feel safe and thrilled at the same time. On the racetrack, both the 328i and 335i accelerate on command, brake with all the force I ask of them, and steer with finesse. It’s like watching a ballet, where grace and style seem to unfold effortlessly, yet I am the one commanding the dance. 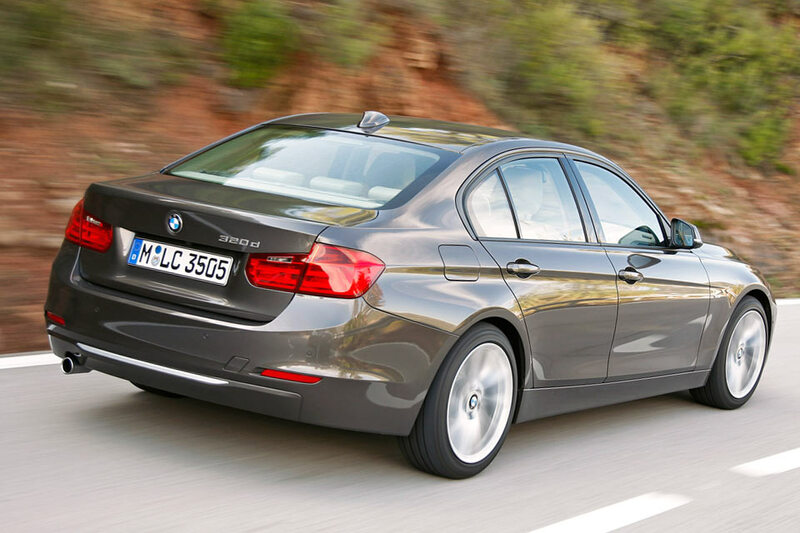 The 2013 BMW 328i has a 4-cylinder engine that has made this model about 30 percent more fuel efficient on the highway than the previous generation 3-Series. It’s blasphemy to some die-hard enthusiasts that BMW swapped the traditional 6-cylinder engine for a smaller, more fuel-sipping 4-cylinder motor. But really, people. This thing now has twin turbochargers and moves from a standstill to 60 mph in a very respectable 5.7 seconds. Plenty fast. If you choose the new 8-speed automatic transmission, the fuel efficiency is one MPG better than with the manual transmission, since a machine usually can manage fuel consumption better than a human. 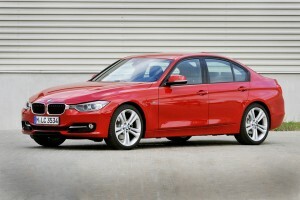 The 2013 BMW 335i still wears a 6-cylinder engine and gets about 20 percent better fuel economy. It also is slightly faster than the last iteration 3-Series. On both 2013 models, an Eco Pro mode next to the gear lever lets the driver hyper-mile, meaning it cuts power to the heating, A/C, and seat heaters, lowering consumption of fuel. It also coaches the driver when it thinks the driver’s lead foot is getting the better of her. BMW execs promise us that if the driver is “very mindful” of using a light foot on the gas pedal, the 328i could get about 40 mpg combined city/hwy driving. But then, if you’re going to hyper mile, you probably should try it in a Prius rather than a sports sedan. 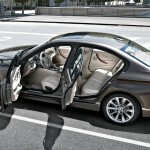 In an effort to offer more standard features in the 2013 models, BMW packaged several things into different trim levels. Again, good and bad. I like that big, sporty 18″ wheels are now standard, since I paid extra for those just three months ago when I purchased my 2011 335d. Also standard now, darn it, is the very nice and colorful display screen. 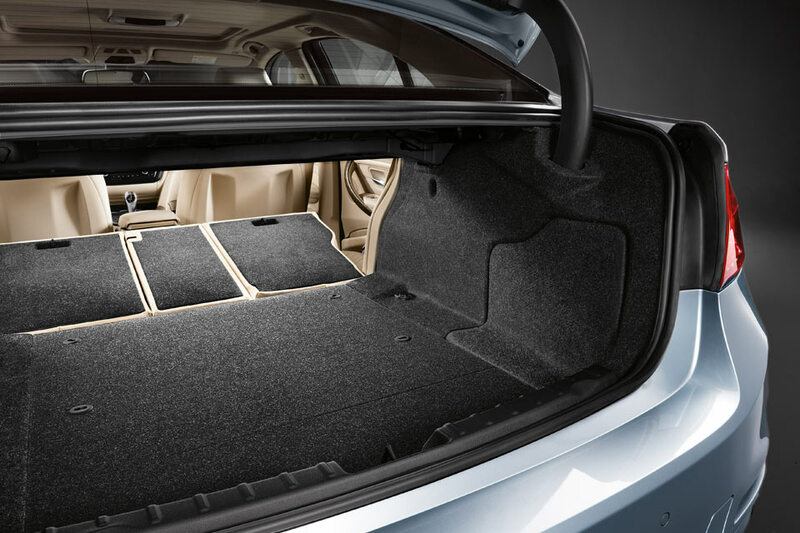 The trunk is larger, able to hold more goodies, and rear leg-room has increased. All of this is fantastic and a welcome change. 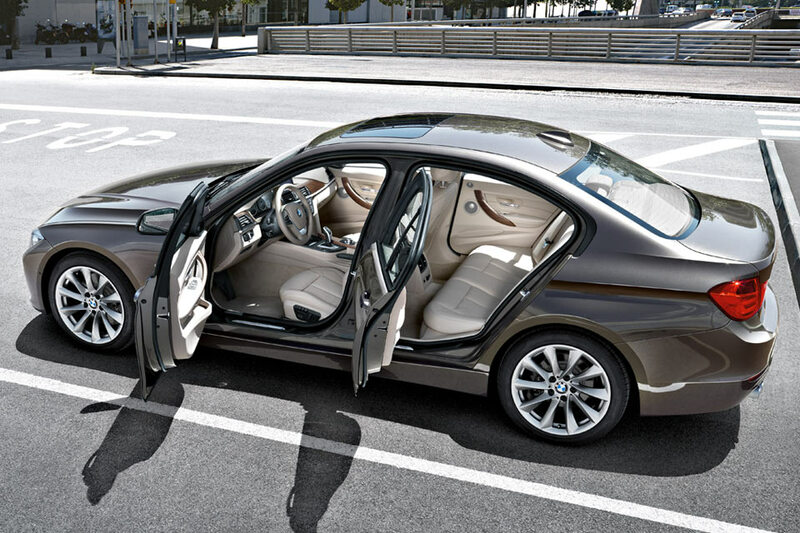 The trim packages speak to different tastes in style. The Modern Line is somewhat Scandinavian, with simple colors of taupe and tan for an open, light and airy look. One issue: a simply horrendous choice of wood grain looks absolutely like the cladding on the Pirate’s Cove Log Ride. You know the kind – an over-exaggerated wood grain that looks cartoonish – except in the new BMW 328i, the wood, we’ve been told, is real. 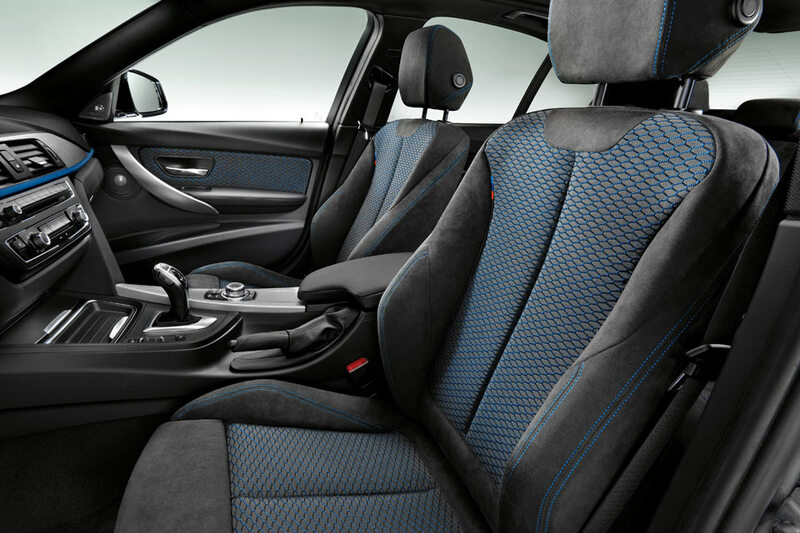 The BMW 3 Series Sport Line is darker, with red or blue seat stitching and colorful trim against black. 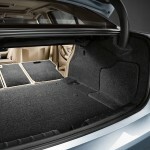 The seats are more bolstered to hold driver and occupants in place under heavy cornering. It’s a much more masculine vibe. And the Luxury Line has the traditional glossy burled wood trim and lots of brushed aluminum accent. Very pretty. 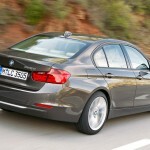 A welcome standard feature on all BMW 3-Series are backseat heating and A/C vents. Sadly, I was disappointed in the cheap-feeling hard plastics, the thin and rough roof lining fabric, and the grainy plastic upper door trim (where my arm rests at the juncture with the side window.) I wonder if there’s a way to reduce weight in these materials and still have them feel nice. Active head restraints reduce the possibility of whiplash. Adaptive brake lights get brighter when brake pedal pressure increases, alerting drivers behind you that you’re stopping quicker than they might realize. And a series of crash sensors activate in the event of an accident disconnecting the alternator, fuel pump and starter from battery, and turning on hazard lights, interior lights and unlocking doors. The airbag array also includes a driver’s side knee airbag, which helps to prevent a broken leg in the case of an off-set frontal crash. 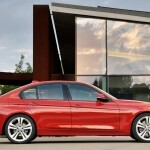 The 2013 BMW 328i and 335i both get decent but certainly not extravagant electronics. Bluetooth is now standard on all cars, as is a 6.5″ display screen. Opt for the $295 BMW Apps and your car will be as updatable as your smartphone. Apps that are on your iPhone (the car isn’t yet compatible with other smartphones), can run on the BMW 3 Series’ communications system. Here, Twitter, Web Radio, Facebook and Pandora are available. If a phone call comes in on your iPhone, the audio system is automatically paused and, hands free, you can take the call with voice recognition. A MOG iPhone app has 14 million songs on tap. BMW Connect, another option, brings thousands of radio stations from around the country into your car through Web Radio. So you can be in South Carolina and listen to a New York City radio station. There’s also Heads-Up Display, which projects pertinent info like MPH and radio station settings in the lower portion of the windshield so the driver never needs to take her eyes off the road. And so that you don’t crash responding to a text on your phone, BMW Connect allows you to send and receive voice-to-text messages. The 2013 BMW 328i comes with standard features like run-flat tires, bluetooth, and a large 6.5" full-color display screen. It starts at $35,795. 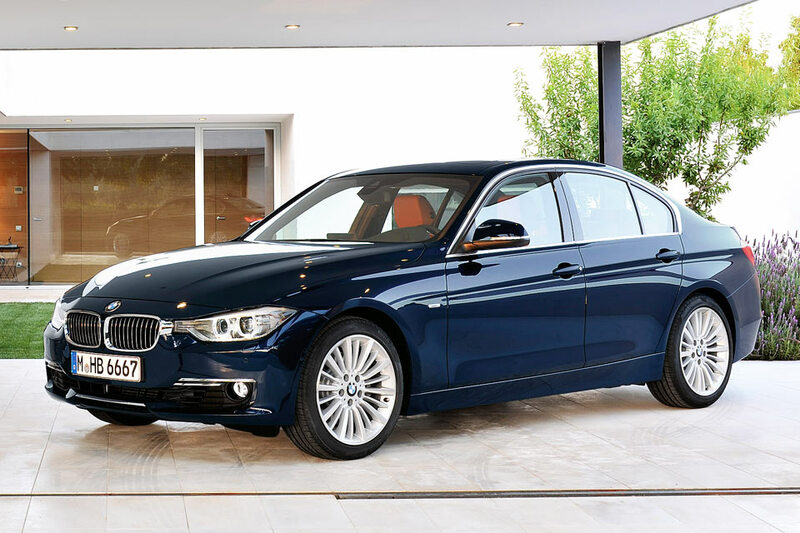 The 2013 BMW 335i comes standard with the above, plus: Xenon Adaptive Headlights, 8-way power front seats, 3-spoke, leather-wrapped multi-function steering wheel. It has a 3.0-liter, 6-cylinder, 300 horsepower engine, which gets 20 mpg city / 30 hwy. It starts at $43,295. 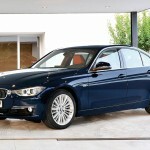 Purists may be upset that the 2012 BMW 328i now is powered by a twin-turbo, 4-cylinder engine. I say, who cares? It's fast and nimble and that's what counts in a sports sedan. And that stellar 3-Series handling is as good as ever, holding tight in turns and feeling safe and planted even at high speeds. What upsets me is the 328i's less luxurious interior. Perhaps a consult from the fashion industry would help. Hi Tara. I just wanted to point out that the 328 is not a twin-turbo motor but instead is a single-turbo with ‘twin power’. Otherwise I think your site is great.